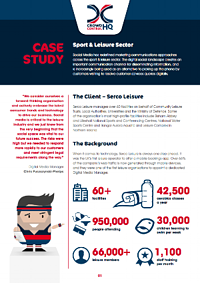 Serco Leisure manage over 60 leisure facilities across the UK on behalf of Local Authorities, Community Leisure Trusts, Universities and the Ministry of Defence. The Digital team recognised that social media had become more important as a communication channel, and was increasingly being used by their customers for customer service enquiries. They needed a professional solution that would allow them to put social media at the heart of their marketing, customer support and communications. Manage 95 Facebook pages across 18 different territories. Enable 70 staff, managers and marketing professionals to publish and engage on social media. Keep customers informed of last-minute changes to classes at their local leisure centre. Get an accurate overview of all social media monitoring and management.